PTFE Adhesive Tape is mainly compound of the fiberglass fabric or the pure film. 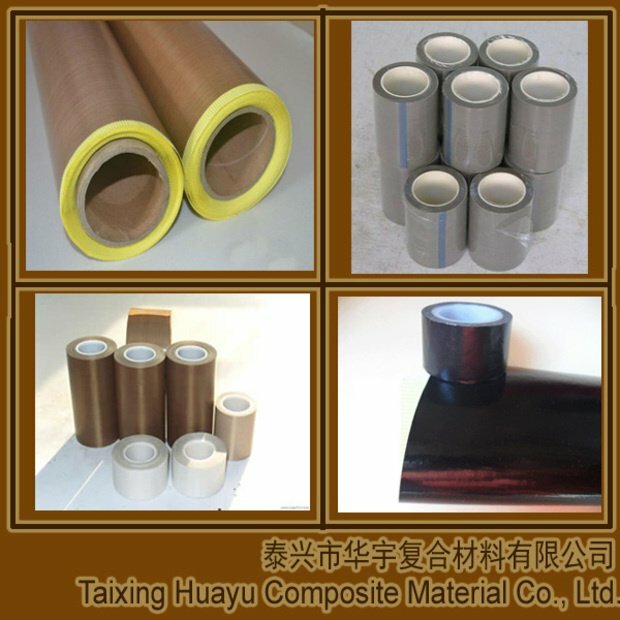 It at least can be sorted into PTFE glass cloth tape and film tape. PTFE Adhesive Tape is a particular composite material mainly compound of the fiberglass fabric or the pure film. As its base cloth, it can be sorted into two categories: one is made up of PTFE fiberglass fabric while the other is made up of pure PTFE film. After covering silicone adhesives on the backside, they are coming into being the shape. If covering silicone adhesives on both sides, they will be called double-sided PTFE tape. So until now, we have at least three kinds of PTFE tapes: PTFE glass fiber tape, PTFE film tape and PTFE double-sided tape. All of them has the excellent properties of high temperature resistance, good anti-adhesive of the smooth surface, good adhesive to some material, high chemical corrosion and flame resistance, convenience to use and etc. Among them, the temperature resistance is unique. For example, it can work continuously under the temperature from –70℃ to 260°C. Even under the temperature up to 280°C, it can still keep the persistent adhesive during a short time. It is extremely safe to use in many industries, as it cannot burn after leaving the fire. The thickness of PTFE Adhesive Tape mainly range from 0.05mm to 0.30mm and the colors are brown, black, white and gray.